Andrew Colburn decided to become a psychiatric mental health nurse practitioner after working with members of the military as a nurse and commissioned officer of the U.S. Public Health Service. Photo by Sarah Schaub. As a nurse and commissioned officer of the U.S. Public Health Service, Andrew Colburn encountered veterans who were addicted to opioids, or had mental health conditions, or both. In many cases, the addiction was a result of treatment received for service-related injuries. The experience changed his career trajectory, Colburn said. 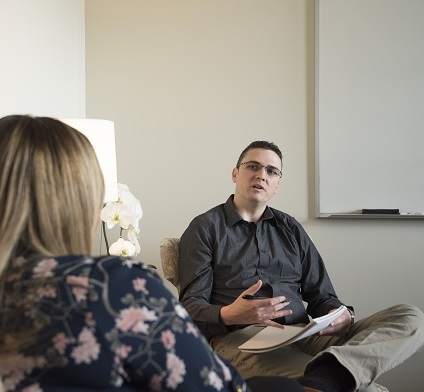 He decided to pursue a Doctor of Nursing Practice (DNP) degree at the Washington State University College of Nursing, with the goal of becoming a psychiatric mental health nurse practitioner working with the military. “I want to serve the people who serve us,” he said. 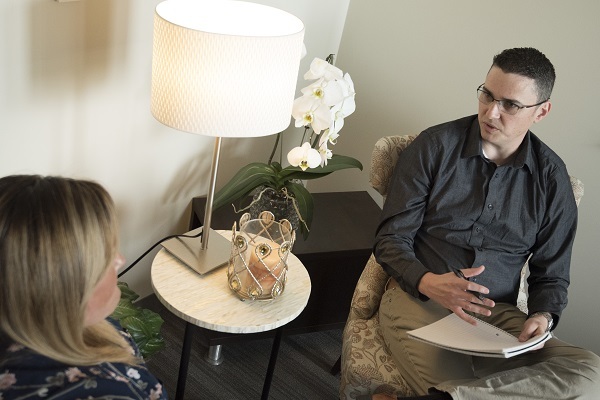 A psychiatric mental health nurse practitioner uses a full scope of therapies to assess, diagnose and treat people with psychiatric disorders. Both military and civilian health care systems are looking to psych NPs to help address critical shortages of mental health practitioners. A 2016 report in the journal Health Affairs noted that for the first time, mental health disorders topped the list of medical conditions in estimated spending nationally. In the Veterans Health Administration, more than 1.5 million of the 5.5 million vets seen in VA hospitals had a mental health diagnosis in 2016, a 31 percent increase since 2004, according to a study published in the International Journal of Mental Health Systems. Colburn pursued and won a competitive Air Force Nurse Health Profession Scholarship, one of four students chosen nationwide in 2016. He was sworn in as a 2nd lieutenant in the Air Force Reserve, and will serve at least three years on active duty when he graduates from the WSU College of Nursing next May. He expects to be assigned to a military treatment facility, hospital or clinic. If he decides to make a career out of the military, he said he hopes to teach. A psych mental health NP is a type of advanced practice registered nurse (APRN). People in this profession assess, diagnose and treat patients with psychiatric disorders or the potential for such disorders, using a full scope of therapies including prescribing medication and administering psychotherapy. According to a 2017 report, the United States has about 13,800 psychiatric advanced practice registered nurses, and it’s estimated there will be nearly 18,000 by 2025. Median salary for a psychiatric APRN nationally is $98,495, with a range of total pay (salary plus bonus) of $77,386 to $143,282. Fall 2019 applications open on August 1.